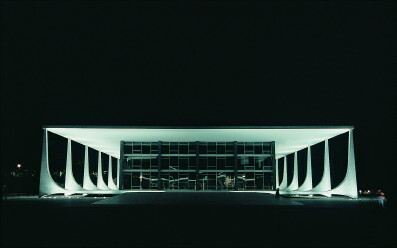 EDITOR’S CHOICE: OSCAR NIEMEYER’S WORK CONTINUES TO ENCHANT AND APPALL STUDENTS OF ARCHITECTURE AND URBAN PLANNING. What possible interest could there be in wandering about? … The street, that meeting ground of … passers-by, of stores and houses, of vehicles and pedestrians … does not exist in Brasília and never will. Today, the city is quite correctly regarded as a colossally wrong turn in urban planning—but Brasília, paradoxically, contains some of the most graceful modernist government buildings ever produced. All were designed by Oscar Niemeyer (now 100 years old and still working), who helped select Costa’s master plan and who was the creative influence behind the building and shape of the city. Both facts must be considered in any effort to reckon the legacy of Niemeyer—the last great architect of the modernist ascendancy—and his relationship to modernism, a relationship that both spurred and warped his creative achievement. A crop of books published over the past few years illuminates both Brazil’s extraordinary achievements in modern architecture from the 1930s to the 1960s (Lauro Cavalcanti’s clear and intelligent When Brazil Was Modern and the ambitious if at times pretentious Brazil’s Modern Architecture, edited by Elisa­betta Andreoli and Adrian Forty) and specific aspects of the career of Niemeyer, an architect revered in his country as its greatest living cultural treasure (Oscar Niemeyer: Houses, by Alan Hess, and Modernist Paradise, by Michael Webb, an opulent explication of the only Niemeyer-designed residence built in the United States). These join such older works as Brazil Builds, the Museum of Modern Art’s seminal introduction to Brazilian modernism; Henrique E. Mindlin’sModern Architecture in Brazil; Norma Evenson’s Two Brazilian Capitals: Architecture and Urbanism in Rio and Brasília; David Underwood’s Oscar Niemeyer and Brazilian Free-Form Modernism; and Niemeyer’s self-indulgent but (intentionally and otherwise) revealing memoir, The Curves of Time. None of these books approaches Sty­liane Philippou’s forthcoming Oscar Niemeyer: Curves of Irreverence, one of the richest historical, cultural, and aesthetic assessments of an architect’s work I’ve read. To be sure, Philippou, a British architect and architectural historian, indulges in some academic gobbledygook (that marker of hip academese, “the Other,” makes its appearance far too often), but in authoritatively assessing Niemeyer’s work and its place in architectural and Brazilian cultural history, she has marshaled such diverse subjects as 18th-century colonial Portuguese architecture, bossa nova, the topography and cultural geography of Copacabana Beach, and the design-selection process for the UN headquarters. The book is also a marvel of presentation. Philippou fluidly explicates her narrative and arguments with detailed site diagrams and maps; drawings, plans, and elevations; photographic comparisons of buildings historically linked to Niemeyer’s; and her own lavish, precise photography of Niemeyer’s work, including both general views and details. Although he was a disciple of Le Corbusier’s and clearly embraced modernism, Niemeyer, with his love of curves and organic shapes, offered a jaunty alternative to the geometric severity of the International Style (a “monotonous and repetitive architecture … so easy to create that it quickly spread from the United States to Japan,” as he characterizes it in his own, often repetitive, memoir). Confirming Niemeyer’s assertions, Philippou repeatedly shows how eroticism inflected Niemeyer’s approach—“form follows feminine” is one of the architect’s many, somewhat tiresome, pronouncements—and how that approach quite literally grew out of his girl-watching (something of a dirty old man, he’s forever explaining his architecture by sketching women’s breasts and backsides for mock-scandalized journalists). He was obviously also inspired by the undulating beaches and topography of his native Rio de Janeiro (his longtime studio, in the penthouse of an Art Deco landmark building, takes in famously sweeping views of Copacabana and Sugarloaf). Philippou demonstrates that Niemeyer’s highest achievements are profoundly informed by a Brazilian aesthetic, which has long made sinuous forms a basic element of its vocabulary (see the mosaic pavements of alternating black and white waves, both from the colonial period and, on Copacabana, from the early 20th century). True, since the 1960s Niemeyer’s penchant for curves and, worse, flying-saucer shapes has gotten the better of him (a penchant he could indulge because of engineering advances in his favorite medium, reinforced concrete, that increased the plasticity of that already famously plastic material)—too many of his later buildings, such as the 1996 Museum of Contemporary Art in Niterói, smack of kitschy Futurama. Niemeyer’s work was best when Brazilian idioms tempered his modernism—and when modernism’s crispness tempered his tendency toward bio­morphic and sculptural excess. Philippou makes this point clear in her brilliant, meticulous analysis of Niemeyer’s first masterpiece, the 1943 Ministry of Education and Public Health in Rio (the design team was made up of Brazilian architects, and Le Corbusier himself served as a consultant, but Niemeyer led the group and designed the project’s key elements). Hailed by MoMA upon its completion as “the most beautiful government building in the Western hemisphere,” the ministry boasts the first use of the curtain wall—which would soon be ubiquitous, as the defining feature of the glass boxes of the International Style (think Lever House). Philippou reveals the peculiarly Brazilian admixture of this modernist masterpiece: the tropical rooftop and street-level gardens featuring organically curved paths and tropical plants (up until this time, native plants were considered unworthy of serious landscape design); the Moorish-Portuguese tiles used on the building’s wall mosaic (itself a somewhat unmodernist embellishment); the brises-soleil inspired by wooden Brazilian colonial Baroque antecedents (to this day, they obviate the use of air-conditioning in this tropical high-rise); the free-form designs on the carpeting (a high level of detail, craft, and finish characterize this and all of Niemeyer’s best buildings, although those qualities are hardly typical of all of his work); and the shady plaza, created by cylindrical columns, which unifies the building site with the parallel streets abutting it and is reminiscent of the cloisters of 17th-century Brazilian monasteries. The Supreme Court’s columns em­-brace the glass box … like pleats fluidly unfolding and refolding, carrying the eye along. Their marble cladding touches the earth at one infinitely small point … The fluid, fan-like effect is best appreciated when walking along the verandas: the great white marble leaves open and close languorously, in slow, perpetual motion, seemingly the source of the cool breeze under the large roof overhangs. These imperishable achievements, though, hardly make up for the rest of the city. In Brasília, too many of Niemeyer’s other sculptural edifices (he designed all of the major government buildings, and much of the housing) are soullessly set in immense paved fields that offer few places to sit and little refuge from the blinding sun, save for the colossal shadows cast by the buildings themselves. To be sure, Brasília’s reputation is in part the result of its history: although built by a progressive and more or less democratic government, it became the seat of an authoritarian regime four years after it was completed, and remained so for 21 years (to Zaha Hadid, Brasília means “all those wide streets for the army to drive through”). But it is an awful city—even juror Ada Louise Huxtable’s tribute accompanying Niemeyer’s citation for the 1988 Pritzker Prize (the equivalent of the Nobel Prize for architecture) had to acknowledge Brasília’s horrendous error. With Brasília, Niemeyer seemed to have embraced, or at least acceded to, the worst aspect of architectural modernism—its antiseptic urban theory—and in the post-Brasília period, when his work has too often been hokily sculptural or frighteningly overscaled (see his University of Constantine in Algeria, or his Maison de la Culture in Le Havre), he seems to have forsaken its best aspects: the grace and lucidity born of its restraint.